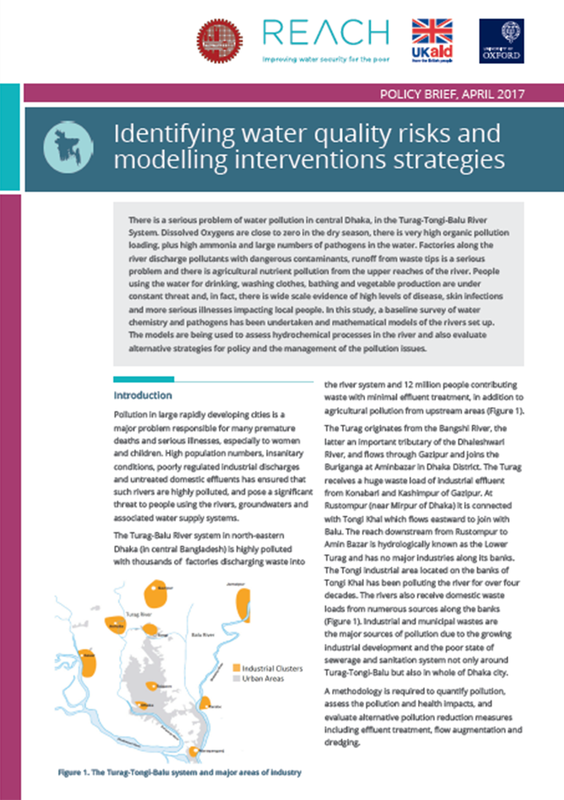 There is a serious problem of water pollution in central Dhaka, in the Turag-Tongi-Balu River System. Dissolved Oxygen is close to zero in the dry season, there is very high organic pollution loading, as well as high ammonia and large numbers of pathogens in the water. Factories along the river discharge pollutants with dangerous contaminants, runoff from waste tips is a serious problem and there is agricultural nutrient pollution from the upper reaches of the river. People using the water for drinking, washing clothes, bathing and vegetable production face different and varying health risks. In this study, a baseline survey of water chemistry and pathogens has been undertaken and mathematical models of the rivers set up. The models are being used to assess hydrochemical processes in the river and also evaluate alternative strategies for policy and the management of the pollution issues.